We used the same Rhodamine and chloroauric acid samples as last week for all samples described today. We made a new lysozyme stock that was 46.79µM. Because we had incubated the samples that we synthesized on February 17, 2016 in Rhodamine B for 24 hours, we decided to incubate the samples that we synthesized on February 23, 2016 for 3.5 hours. Then, we could try to determine whether incubating the samples in Rhodamine for longer periods of time helped incorporate more Rhodamine into the fibers. The following table shows the amount of Rhomdaine B added to each sample. We then covered the tops of the test tubes in parafilm and incubated the samples at room temperature for 3.5 hours. First, we took fluorescence measurements of Rhodamine in varying concentrations of AuNP. Next, we took fluorescence measurements of the supernatants of each of the samples synthesized on February 17, 2016 after being incubated in Rhodamine for 24 hours. We then took fluorescence measurements of the supernatants of each of the samples synthesized on February 23, 2016 after being incubated in Rhodamine for 3.5 hours. For each measurement, we used 200µL of sample. We also took one measurement of a 1µM Rhodamine standard (in DI water). Each of the samples had a total volume of 5mL and were made in glass test tubes. We sealed the test tubes by covering the top with aluminum foil and then taping the foil down with labeling tape so that no vapors could escape. We then incubated the samples in the oven at 80°C for four hours. Since only measured the fluorescence of one Rhodamine standard, we could not make a calibration curve to determine the change in the concentration of Rhodamine in the supernatant based on our fluorescence measurements of the supernatants. Next week, we will measure Rhodamine standards so that we can determine the change in Rhodamine concentration. 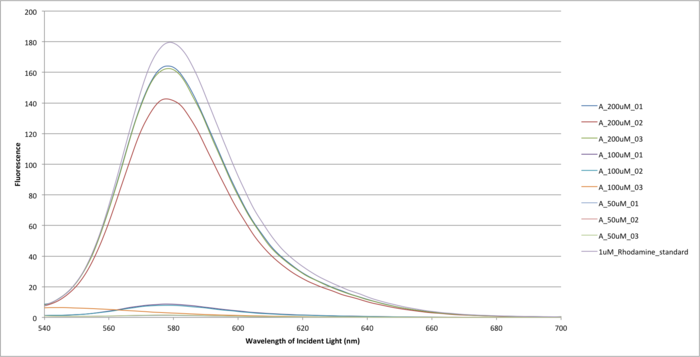 The above image shows the raw fluorescence data for each sample we measured. The fluorescence is shown as a function of the wavelength of fluorescence (nm). The concentration of Rhodamine added to the A_200uM samples was 1µM. The concentration of Rhodamine added to the A_100uM samples was 0.1µM. The concentration of Rhodamine added to the A_50uM samples was 0.01µM. No Rhodamine was added to the au_lys_after sample; this sample was a blank. The pink hue in the samples, especially the A_200uM samples, is due to the Rhodamine and not the presence of AuNP. Figure 2a: From Left to Right: Samples A_1uM_01, A_1uM_02, A_1uM_03, A_1uM_04 These samples were synthesized on February 23, 2016. They were going to be incubated in 1µM Rhodamine for 3.5 hours. This image was taken before the incubation in Rhodamine. Figure 2b: From Left to Right: Samples A_0.1uM_01, A_0.1uM_02, A_0.1uM_03, A_0.1uM_04 These samples were synthesized on February 23, 2016. They were going to be incubated in 0.1µM Rhodamine for 3.5 hours. This image was taken before the incubation in Rhodamine. Figure 2c: From Left to Right: Samples A_0.01uM_01, A_0.01uM_02, A_0.01uM_03, A_0.01uM_04 These samples were synthesized on February 23, 2016. They were going to be incubated in 0.01µM Rhodamine for 3.5 hours. This image was taken before the incubation in Rhodamine. This image was taken after the samples had been incubated in Rhodamine for 2 hours. We did not measure the fluorescence of the supernatants of these samples until they had incubated in Rhodamine for 3.5 hours. All of the samples ending in _04 did not receive any Rhodamine. These were blanks. This page was last edited on 27 September 2017, at 01:38.